Granite has been one of the most sought-after countertop materials for many, many years now — and for good reason! Granite countertops are durable, beautiful, easy to take care of, and can last forever with proper care and maintenance. When you install granite countertops, you give your kitchen or bath an aura of distinction and permanence. 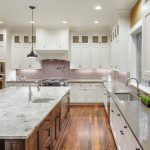 Larger scale: Tiny samples of granite can be great starting points to narrow down your selections, but you need to choose from the slab for your final choice for granite countertops. When you can see your sample on a larger scale, you’re better able to see what the overall coloring looks like as well as if it will work with your other materials. Avoid inclusions: Granite is a natural material and therefore may have some large inclusions in some areas. If you want to avoid certain inclusions, a manufacturer can occasionally work the slab around the inclusions to give you a more appealing product. Accurate colors: If you’ve ever seen a granite sample and then the slab, you know that sample colors aren’t always accurate for what you’re getting. The slab might appear with a little more blue, green, gray, or black, which can alter the overall appearance of the color. For great options in granite countertops, come choose your slab down at The Granite Guy!